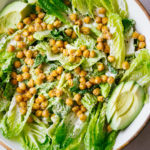 This vegan caesar salad with garlicky chickpea croutons is so easy to make and absolutely delicious! Recipe is dairy free, egg free and perfect for lunch, dinner or make ahead meal ideas. Preheat oven to 400 degrees F. Line a rimmed baking sheet with parchment paper or silpat. Chickpea Croutons: Place rinsed chickpeas between a clean dish cloth, and gently rub them to dry, removing any of the loose skins. Place chickpeas on a prepared baking sheet, drizzle with oil and toss to coat, sprinkle with garlic powder and salt. Arrange chickpeas in a single layer, and garlic cloves (from the dressing), and bake for 35 – 40 minutes, stirring every 10 minutes or so. Remove from oven, set aside. Caesar Salad Dressing: Soak the cashew in hot water (not boiling) for 5 minutes, drain. In a high speed or personal blender, add the cashews, water, roasted garlic cloves, capers, worcestershire, dijon, lemon juice, salt & pepper, blend until creamy smooth. Assemble: Place the chopped romaine in a large mixing bowl, add as much or as little of the dressing as you like, you may have some leftover, and give a good toss. Top with chickpea croutons, avocado, and a sprinkle of Almond Parmesan. If you don’t have capers, no worries, the dressing is just as great without them!